THERE is a famous American South saying that goes, "If it ain't broke, don't fix it". In the more enlightened North, branding gurus and academics would prescribe a rebranding exercise for ailing entities. Let me explain why the Central Provident Fund (CPF) system ain't ailing nor broke (no pun intended), and why we should actually be celebrating the fact that some folks from the pioneer generation almost 60 years ago had the foresight and extraordinary prescience to come up with a mandatory, fully-funded, defined contribution social security savings system that is able to provide for our basic retirement expense needs with assurance. A DEFINED contribution (DC) plan - like the CPF, the 401(k) programme in the United States and Australia's Superannuation scheme - is one in which the employee, along with the employer in many cases, make contributions to an employee's individual retirement account on a monthly and tax-advantaged basis. In a defined benefit (DB) plan, the sponsor promises to provide the retiree with a pension income, which is usually a function of her salary, tenure of service and so on. The CPF savings scheme, along with CPF Life, an annuity plan with a clear schedule of benefits, is almost a hybrid of the two plans. But that is where the similarities end. In America, many DB plans are going broke or are grossly underfunded, which means they are making promises to future retirees that they cannot keep. As a consequence, the trend around the world is for systems to move towards a CPF-like, hybrid DC/DB retirement savings system - that is, with fully-funded individual accounts that cumulate over one's working years, with some (but not a large) amount of investment and withdrawal flexibility, and that converts to a life annuity upon retirement. The beauty of the CPF system is that it has been practising this for many years, with savings rates of up to 5 per cent per annum. There is also the recent CPF Life annuity scheme, both fully-guaranteed by the Government. There is an employer-matching and tax-advantaged supplementary retirement scheme to boot. The CPF offers 3.5 per cent interest for the first $20,000 of Ordinary Account savings, and 2.5 per cent for sums above that in the OA. It gives 5 per cent on the first $40,000 of balances in the Special, Medisave and Retirement Accounts (SMRA) and 4 per cent for sums above that in the SMRA. What's significant is that these are guaranteed rates devoid of risk. This is in effect the Government's "borrowing rate" from CPF's members. One may rightly ask why any sound government would borrow at 4 to 5 per cent when it could go to the public debt markets and borrow at around 2.9 per cent over 30 years. In effect, the Government is providing a healthy "subsidy" on our Retirement Accounts. Hence, the call to increase the riskless savings rate any further is not prudent. 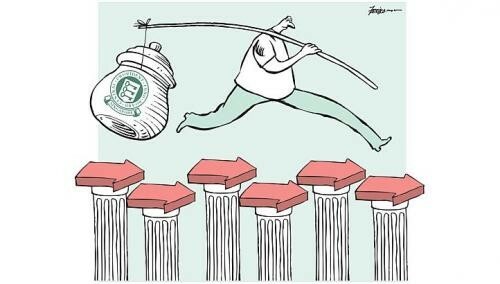 One common criticism of the CPF is that the Government stands to enjoy higher returns from the CPF monies, which are pooled and handed over to investment agency GIC to be invested. GIC returns are sometimes higher than what CPF pays. But we have to realise that it is preferable that a retirement system is not subject to the kind of risk borne by the GIC. The Government, on the other hand, guarantees the CPF savings rates, irrespective of market cycles or global financial crises. What the Government does with the money it raises by issuing Special Singapore Government Securities is part of its business of running government, as long as it is managing its assets and liabilities prudently. To subject CPF members' savings, which is less than the Minimum Sum, to the (risky) returns of the GIC may not be prudent. Neither is the call to increase the risk-taking appetite on our CPF savings - at least for savings not in excess of the Minimum Sum, as the volatile recent stock market experience, circa 2008- 2009, informs us. Lastly, simple financial mathematics tell us that at our current expected mortality and discount rates, the estimated $1,200 payout for CPF Life from the cumulated Minimum Sum of $155,000 is an extremely reasonable payout. Whether this $1,200 is enough for now, or more importantly in our twilight years where the threat of rising prices is real, is another matter. WHILE the overall system is anything but broken, that's not to say some parts of it don't need fixing. As the Government looks into improving the CPF system, it can learn from the good and bad experience of many other countries, as well as academic studies, so that we do not unnecessarily change a system that works. And rather, make a good system even better. Back to basics: A good retirement savings programme is focused on basic retirement and medical expenses. Keeping to this objective is key. Resist temptation: The temptation to dig into one's retirement pot excessively for current needs, be it for housing, medical expenses or education, can lead to severe underfunding consequences down the road, which is when you need the money the most. This phenomenon, which anecdotally seems fairly prevalent in Singapore, may be the reason why a recent HSBC Insurance "Future of Retirement - Singapore Report" Survey indicated that only 57 per cent of survey respondents in Singapore felt that they had enough money to live on in retirement. That said, most experts agree that withdrawals for severe emergencies and exigencies should be allowed. In my view, we should not allow CPF retirement savings to be used for housing, medical and education needs. Like in the United States, these should be run as separate programmes with appropriate tax incentives to encourage savings. For life: Life annuities are a necessary and prudent retirement product for meeting one's basic retirement and medical expenses, or more. Given that it is a life product, the more guaranteed the better - after all, it would be very painful to find out in 20 years' time that one's insurance provider of a life annuity has gone from being "AAA"-rated to a ward of the state overnight. CPF Life, with payouts guaranteed by the Government, is hence the right basic life annuity product for all. Where it can be improved upon though, is the ability to cover inflation. CPF Life should be inflation-indexed, to take into account rising costs of living over the years. Several default funds: For accounts that allow for it, giving too much investment choice is not a good thing as it leads to "investor paralysis" (not knowing what to invest in amid too many choices). What is instead needed is a few well-diversified and low-cost asset allocation funds that members, who wish to seek more risk-adjusted returns, can pick from. The default asset allocation fund, for those who do not need or want the additional options, should be the most conservative one. The call to introduce private pension plans is in sync with this idea. These higher-risk investment strategies, however, should be available only to those who have met - or show the potential via their current savings level to meet - say, a Minimum Sum, which in itself should convert to a guaranteed life stream of payouts for basic life needs at retirement, like a CPF Life. This part of the programme can be managed by the CPF Board, government-linked entities, the private sector, or a combination of all three as a private-public partnership. Limit lump-sum withdrawals: Lump-sum withdrawals at retirement could be sub-optimal irrespective of your religion, race, nationality and education level. To a certain extent, financial theory and anecdotal evidence in the United States suggest that the temptation is to spend lump sums, especially if one is cash-strapped, not realising there may be too little left for one's retirement needs until it is too late. This is the reason why many advanced nations are introducing inflation-indexed life annuities into their retirement programmes. Monetise flat: A leasehold apartment, which is not expected to stay for generations within a family, is a perfect asset to monetise so as to supplement and enhance our income for life's basic needs, leisure and pleasure in retirement. To that end, the Housing Board has various home monetisation programmes available for CPF members. Again, such programmes should be kept simple for the layman to understand and participate in, with minimal equations, mathematical inequalities, and with shelter for life assured (preferably in one's own apartment). Public education: Basic financial and retirement savings education for all is necessary and an imperative, but it is not the panacea for our retirement planning woes. Some fundamental decision-making with respect to our retirement savings has to be handled benevolently at the state level. In summary, the CPF system is not broke or badly designed, although it may need certain improvements, as the Prime Minister himself has admitted recently. Indeed, he mentioned he will be charging a committee to look into all this. With one's housing to rely on, and the additional support of Workfare, Silver Support, and other prudent financial support schemes from the Government, Singapore should be in good shape to weather retirement. The writer is a practice professor and director of the National University of Singapore Business School's Centre for Asset Management Research and Investments.